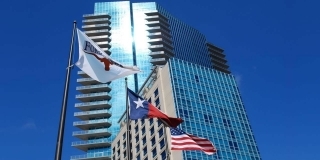 Standing at 23 stories, the first 15 floors of the impressive Omni Fort Worth Hotel houses 607 luxurious guest rooms and suites, 68,000 SF of state-of-the-art meeting space, five dining options and a full service spa. Sitting atop the hotel are 89 residences that are now Fort Worth’s most luxurious and sought after high-rise addresses, including a private residence rooftop pool and terrace. The Hotel and surrounding development marks the latest phase of the revitalization spreading across the greater Dallas / Fort Worth area.